Casco Bay, the area from Cape Elizabeth on the south to Cape Small on the north, is dotted with hundreds of islands referred to as the Calendar Islands because there are said to be 365 of them - as many as there are days in a year. Some of these islands are accessible by ferry or tour boats and are well worth the trip. 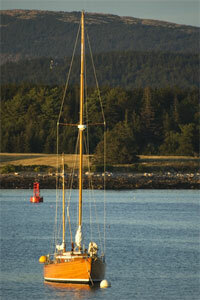 In fact, no visit to the Portland area is complete without an island-hopping cruise in Casco Bay. The bay has a rich history. 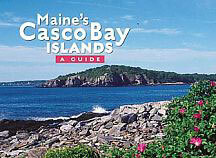 There are two theories on the origin of the name "Casco Bay". One theory is based on Spanish explorer Esteban Gomez explored the Maine coast in 1525 and named the bay "Bahia de Cascos" (Bay of Helmets, based on the shape of the bay). The second theory is based on Aucocisco, the Abenaki name for the bay, which means 'place of herons' (or sometimes translated as 'muddy'). The islands in the bay are also called the Calendar Islands, based on the popular myth there are 365 islands. This was first reported in 1700 by Colonel Wolfgang William Romer, a military engineer, who reported there were "as many islands as there are days in the year." The United States Coastal Pilot lists 136 islands. Robert M. York, the former Maine state historian, said there are "little more than two hundred islands." The bay is also home to abandoned military fortifications dating from the War of 1812 through World War II; During World War II Casco Bay served as an anchorage for U.S. Navy ships. The State Historic Site of Eagle Island was the summer home of Arctic explorer Robert Peary. Promenently situated in Casco Bay is Fort Gorges, a United States military fort built on Hog Island Ledge. Following the War of 1812, the United States Army Corps of Engineers proposed that a fort be at the entrance to Portland Harbor. Named for the colonial proprietor of Maine, Sir Ferdinando Gorges, it was constructed to support existing forts, including Fort Preble in South Portland and Fort Scammel built on nearby House Island in 1808. Congress, however, did not fund construction of Fort Gorges until 1857. The walls of the fort were begun the next year, and when the American Civil War broke out in 1861, work quickly advanced. The fort was designed by Colonel Reuben Staples Smart. The chief architect in charge of construction was Thomas Lincoln Casey, who later became Chief of Engineers. It is similar in size and construction to Fort Sumter, but is built of granite instead of brick. In 1865, when the war ended, the fort was finally completed. Eventually, modern explosives made the fort obsolete by the time it was ready for service. A modernization plan was begun in 1869, but funding was cut off in 1876, with the third level of the fort still unfinished. During the modernization project, sod-covered sand was added to the top level of the fort to protect gun encasements and powder magazines from attacks. The fort was last used by the military during World War II, when it was used to store submarine mines. It was acquired by the city of Portland in 1960 and placed on the National Register of Historic Places.